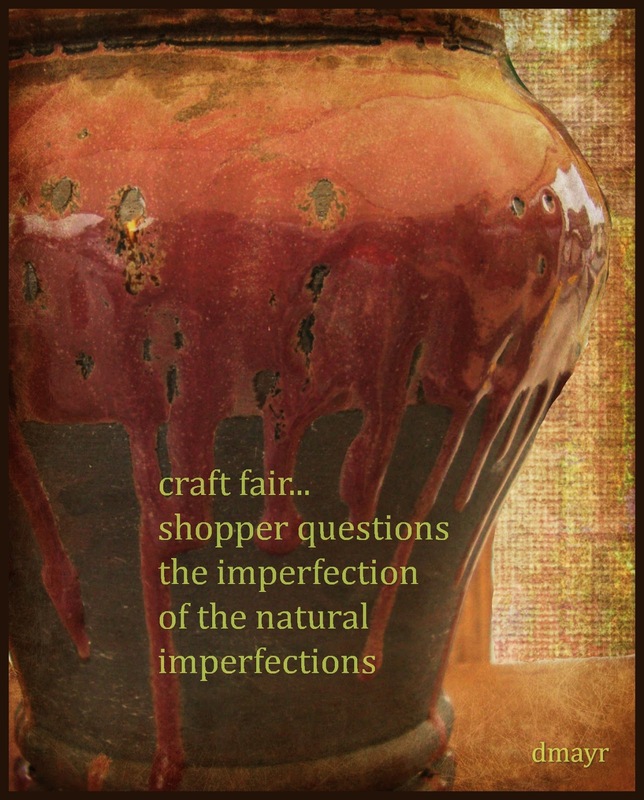 Random Noodling: Poetry Friday--"Craft Fair"
Five years ago I spent an afternoon with my son at a small outdoor crafts fair. After listening to some of the questions he got on the pottery he had on display, I decided that if I ever got the urge to market creative work, I should have my head examined! Patience is not a characteristic I possess. Do you find yourself having to explain your work? How do you react? How well do you differentiate between constructive criticism and "I think you should do it this way"? Once you market your work, does it change your focus? How do you decide if your work deserves to be seen? Do you continue to work if no one stops to look at, comment, or purchase it? I'm not looking to market anything, I'm only curious as to how other people answer these questions for themselves. Hurry over to Beyond Literacy Link where Carol is hosting the Round-Up! Your questions have me pondering, Diane. I've only ever "marketed" my writing (book, articles, poems) or my baking to the intended audiences, nothing like the meandering masses at an art fair. Because of that, I welcome criticism -- it comes most often in considered form, from a person whose expertise I trust and value. Quite a different experience from your son's! Marketing to an editor isn't putting your stuff out on public display--that takes real guts, I guess. Collecting does tend to get out of hand! Like Brenda, I'm careful with my comments at craft fairs. I always feel sorry for the sellers with little or no traffic at their tables/booths. It's not easy putting your work out there. Great questions! It's so hard to give others a chance to criticize. I find myself often with a strange mixture of feelings: I want everyone to read what I've written, at the very same time as I want nobody to read it. I love this pot. I think the best thing I ever did, when I first started out writing for children, was to join a critique group. Everyone agreed that no punches would be pulled if people were going to improve, but we also trusted each other. Okay, back in to write my response a second time-cyberbugs at work. Diane, your son's pot is stunning. I love the glaze work, the colors, the shape and appreciate the time it took him to design the piece. I have a similar comment for your tanka that pairs so beautifully with the pot. The words lend themselves to a reflection on the art of creation. I design, bake, create because of the urge to do so, the energy I get from the experience, and the pleasure of providing a visual or edible delight to friends, family, supporters. Our craft comes from a passion within. I agree, Carol. I gave up submitting years ago (with rare exceptions). I create because it makes me happy. I post my work because the act of creation has made me happy and I hope the result might bring someone else happiness, too. Does your son sell online? I think he might have some takers among the PF crowd. You bring up interesting points today...I think you need a lot of confidence in your work to deal with the public directly! No...he now has two sons, a demanding job, and a new home--pottery has taken a back seat for a while. Thanks for asking, though! I always enjoy your visual/literary pairings, Diane. And what great questions you raise. I'm trying to dampen my enthusiasm to defend my work when someone critiques it, and rather listen. About sharing work, I've noticed that even entering a poem I've written in the dashboard of my blog and then seeing it in "Preview" prompts more edits. The process of sharing one's work is complex. A book I really like that addresses this subject is Bonni Goldberg's Beyond the Words, where she addresses three processes that don't get a lot of attention: Percolation, Revision, and Going Public.